“I am sending you this note in appreciation of the fantastic job you did on our washroom. Most people want a good job done quickly; you usually get one or the other – we got both. 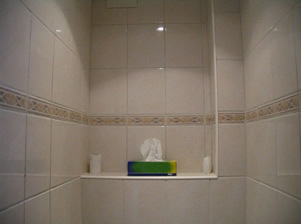 We needed our bathroom done by September 1, which only gave your company about 10 working days to do the whole job. The bathroom was completely gutted; there was no plumbing and the floor joists had to be reinforced because the last plumbing company had compromised the strength of the supports by cutting them. Everything had to be totally and completely redone. Your company said they could do the job on time, and they did. It was good quality work and absolutely no corners were cut." We provide everything from complete bathroom renovations, bathroom remodeling, custom glass shower stalls, glass steam/spa enclosures, bathroom upgrades, custom cabinetry and radiant floor heating, the list of services is extensive. 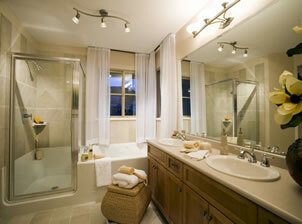 We can provide, design and install custom bathroom renovations. 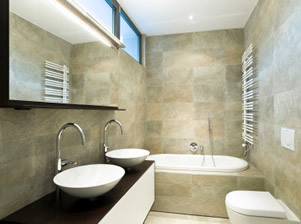 We are the London bathroom renovators providing you with "turnkey" bathroom remodeling (we provide all fixtures and tiles as well, you do not have to supply your own unless you wish to). 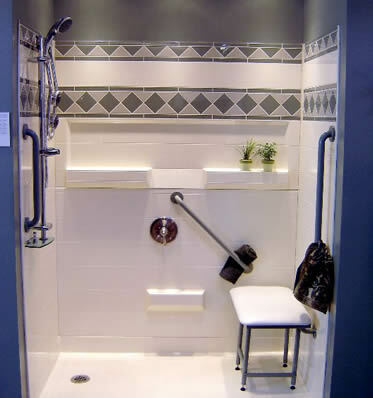 Macfadyen Design & Build have the capability and expertise to design/build wheelchair-accessible bathrooms and/or universal- access bathrooms for your home. They need not look institutional as they can be furnished with almost any luxury fixtures/tiles and finishes and still be totally "ergonomically friendly".